FIFA 2018 Host Cities. 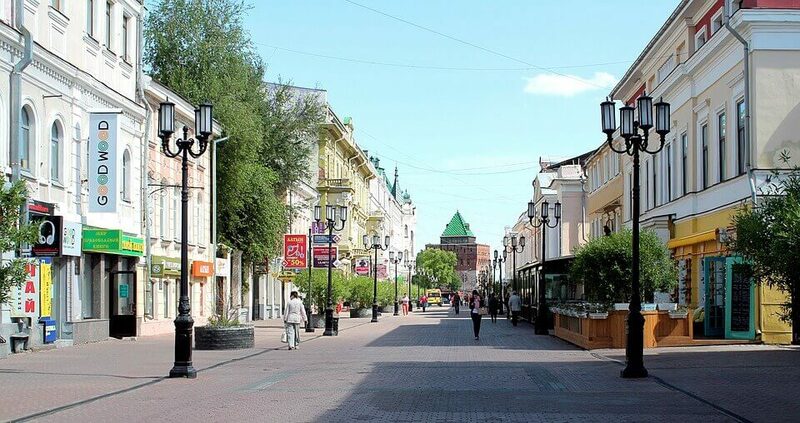 What to do in Nizhny Novgorod? If you are planning to support the English football team in Nizhny Novgorod this summer, you are in for a treat. The city not only boasts a renovated stadium for sports enthusiasts but is also a unique historical and cultural centre of Russia. So what are the things to do in Nizhny Novgorod? Currently under construction, the Stadium was chosen to host four first round group matches, one round of 16 matches, and one quarter-final. Located in the area called Strelka, the design of the stadium was inspired by the natural beauty and serenity of the Volga river. The semi-transparent exterior lit up at night representing purity and modernisation at the same time. More than that, the stadium is an investment in young people: "We have spoken with foreign experts who visited the area," explained the governor of the Nizhny Novgorod Oblast Valery Shantsev. "They told us the work was of the highest quality. This is very important because the stadium will remain as a fine legacy after the World Cup. There are many buildings beneath the stands, where it will be possible to organise numerous classes and open up a sports school." For those passionate about history, Nizhny Novgorod Kremlin is a special delight. Never conquered by an enemy, it sits above the rest of the city since the 16th century. Have a look around and stroll down the picturesque Chkalov stairs to have a picnic by the river or just lie in the sun enjoying the breeze on a hot summer day. The Museum of Old Equipment and Tools is a hidden gem of Nizhny Novgorod and is definitely worth a visit. The museum boasts a rich collection of old-fashioned bicycles, watches, measuring tools and musical instruments. The most fascinating thing about the museum is that the objects are interactive and you are allowed to touch history with your own hands! One of the unique experiences in Nizhny Novgorod is its cableway. Used as a public transport by the locals, it will take you to the town of Bor on the other side of the river. Spend an afternoon enjoying the breath-taking view of the city and the Volga. Don’t forget the camera! Football fans will get excited about how many sports bars the city has to offer. Spor-bar on Piskunova is the most popular place to watch football, have a pint and meet likeminded people. For those wishing to combine Russian cuisine with their favourite sport, 29/25 Corner Pub is the place to be. Want to combine football, dinner and shopping? Kill three birds with one stone at Champs!